Chloe Jones won bronze in the Lincolnshire County Championships 800m freestyle. Bethany Eagle-Brown and Chloe Jones wrapped up the final medal-winning performances for Deepings Swimming Club at the Lincolnshire County Championships. They won age group silver and bronze medals respectively in the 800m freestyle. The two national squad swimmers were part of a six-strong girls’ team competing in the event, which took place at Grantham on Saturday. The club also had two representatives in the boys 1500m freestyle. Jones, competing in the 16/over age group, also collected bronze in the open championship, which takes into consideration the times for all swimmers competing in the 800m freestyle. She was one of five Deepings Swimming Club swimmers competing in the 16/over race from a start list of 11. Jessie Spooner finished fifth and Holly Leggott was sixth, with both girls achieving the Midlands qualifying time. Lexy Cooper was seventh, just outside the Midlands time, and Hannah Matthews finished 10th, lowering her personal best by a massive 14 seconds. 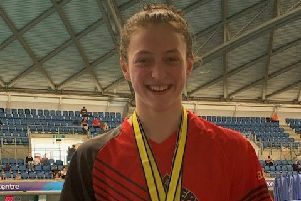 Eagle-Brown, who competed in the 15 years age group, also achieved the Midlands qualifying time after knocking 10 seconds off her personal best. In the boys 1500m freestyle, Ben Beedell narrowly missed out on a medal, finishing fourth in the 16/over age group, while Kallum Penman touched home in sixth place. With all three weekends of county championship racing now complete, Deepings Swimming Club won 68 medals, including 21 golds. The team of 46 swimmers also broke two club records and one county record, while achieving 53 Midlands times and 138 personal bests. Head coach Lynn Chapman said: “We had excellent representation at the distance events, especially in the 16/over race. Everyone swam hard and should be proud of their efforts. Deepings Swimming Club will have two representatives at the British Championships in Edinburgh on March 1-4. Isabel Spinley and Bailie Harrison have both qualified with Spinley competing in the 50m, 100m and 200m fly and 400m individual medley, and Harrison in the 50 fly.